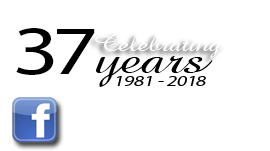 Joey's has provided Lafayette with the best selection of prime & choice steaks, Cajun specialty meats and fresh seafood since 1981. Fresh seafood arrives daily and our ability to order seafood to arrive when you need it sets us apart from the rest. Come and taste what all the fuss is about! Imagine sitting down with friends to a dinner of shrimp stuffed eggplant, crawfish fettuccini or beef stroganoff. Now imagine you're at your own dinner table! We offer the largest selection of Chef-Prepared heat & serve entrees, appetizers, soups and casseroles. We are Lafayette's answer to"What's for Dinner?" 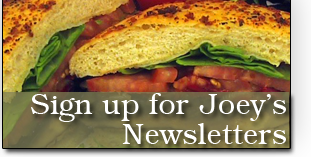 Joey's full service deli offers a wide variety of freshly prepared salads, dips & spreads, imported & domestic meats & cheeses. Joey's signature Shrimp Salad has been a customer favorite from the beginning and has become a legend in Lafayette. Joey’s dessert case features a variety of confections such as Joey's signature cake balls, cheesecake balls, pecan clusters, bread pudding, dessert bars and more. Let Joey's provide you with a sweet ending to any meal. Joey's wine department features wines which have been hand selected throughout the years. Whether you're looking for a wine for a special occasion meal or just a good wine to enjoy with friends, we're here to help you make the right selection. 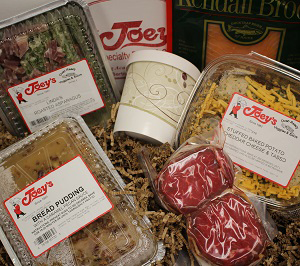 Joey's Gift Boxes - Specialty Meats, Steaks, Prepared Foods, Deserts and more. Click here for our gift baskets, or drop by to create your own custom basket.